Now in The Washington Post online. Tomorrow in the paper edition. "U.S. will expel 15 Cuban diplomats, escalating tensions over mystery illnesses"
The United States sends the majority of Cuban diplomats packing, according to The Washington Times. While the “US confirms additional victim of mysterious attacks in Cuba, raising total to 22 Americans in all,” reported The Washington Post. The shipment intercepted at the Panama Canal had originated in Cuba. The Obama Administration didn’t think it was important enough to impact on their negotiations with Havana. Eventually those warplanes, weapons, and missiles were returned to Cuba. The freighter intercepted at the Suez Canal complicates Washington’s relationship with Egypt, reportedly the buyer of the North Korean weapons. The Washington Post said that "Even as the United States and its allies pile on the sanctions, Kim continues to quietly reap profits from selling cheap conventional weapons and military hardware to a list of customers and beneficiaries that has at times included Iran, Burma, Cuba, Syria, Eritrea and at least two terrorist groups, as well as key U.S. allies such as Egypt, analysts said." The State Department is expelling 15 Cuban diplomats after slashing the U.S. mission in Cuba last week in response to months of unexplained injuries to American personnel. The decision announced Tuesday is certain to deepen the rift between the two countries over what the State Department has called “specific attacks” on U.S. diplomats during the past 10 months. The United States has not blamed Cuba, which has denied any involvement and has cooperated with FBI agents dispatched there. The expelled Cubans, whose names were on a list presented to the Cuban ambassador Tuesdaymorning, will have seven days to leave the country. Last week, the State Department said it would pull more than half its personnel out of the U.S. Embassy in Havana, and they are expected to leave by the end of the week. Neither the FBI nor a separate Cuba investigation has been able to determine what and who is causing the maladies that have befallen at least 22 Americans stationed at the embassy, with symptoms ranging from hearing loss to cognitive disorders. They are believed to have been “targeted” either in their residences within compounds owned by the Cuban government, or in hotels. The most recent incident occurred in late August, but some conditions are still being diagnosed. Only Monday, the State Department confirmed an additional victim, who is believed to have been attacked in January. One possibility being explored is whether the diplomats were made ill by a “sonic attack,” though the State Department has refrained from using that term. It’s also possible that they are being singled out by a third country seeking to create tension between Cuba and the United States, which normalized relations and reopened their embassies only two years ago after half a century of enmity. Now what had been hoped was a historic opening is backsliding to an era of mutual suspicion and recrimination. Last Friday, the State Department issued a travel warning advising all American visitors to stay away because their safety could not be guaranteed, a measure that is certain to harm Cuban tourism, the most dynamic segment of the economy. It also suspended issuing visas to Cubans, a step that makes it difficult for Cuban Americans to reunite with relatives. Cuban officials have said they are disappointed with the U.S. measures, which sent Foreign Minister Bruno Rodriguez to Washington last week in a futile attempt to dissuade Secretary of State Rex Tillerson from employing them. But the Cubans have said they will continue to cooperate with U.S. authorities in what is already an unprecedented willingness to allow FBI agents into Cuba to investigate. The 15 Cuban diplomats being expelled is about the same percentage being withdrawn from the U.S. Embassy, officials said, though the actual number of personnel ordered to leave Havana has not been disclosed. The Americans will not be allowed to return to Cuba until the government in Havana can ensure their well-being, said the U.S. official assigned to brief reporters on the expulsion. He could not, however, explain how the Cubans could offer those assurances if it has not been determined how the injuries were caused or when it may be deemed safe for diplomats to return. General Raul Castro and Miguel Diaz Canel. The limited economic changes introduced by Gen. Raul Castro in Cubaencouraged some observers to proclaim the end of communism and the dismantling of the totalitarian system in the island. Notwithstanding Raul Castro’s own statements that he was not elected to restore capitalism, these observers insist on their belief that economic reforms will be deepened and Cuba will march merrily into capitalism or at least a Chinese-style capitalism. If the objectives of the Castro government were truly to move toward a market economy, it would not limit economic enterprises to some 181 individual activities, i.e. barbershops, shoe shinning, pizza parlors; to lease vacant lands to individual farmers to produce mostly subsistence agriculture; or to liberalize the real estate and auto markets. In addition, the onerous taxes, regulations, and license fees imposed on these activities are not conducive toward the development of free enterprises. It is very difficult for Gen. Raul Castro to reject his brother’s legacy of political and economic centralization. Raul’s legitimacy is based on being Fidel’s heir. Any major move to reject Fidel’s “teachings” would create uncertainty among Cuba’s ruling elites – party and military. It could also increase instability as some would advocate rapid change, while others cling to more orthodox policies. Cubans could see this as an opportunity for mobilization, demanding faster reforms. For Raul, the uncertainties of uncorking the genie’s reform bottle in Cuba are greater than keeping the lid on and moving cautiously. For the past five decades, political considerations have always dictated the economic decisions of the communist leadership in the island. Raul is no Deng Xiaoping, Gorbachev or a pragmatist in military uniform. Before taking power in 2006, he had been the longest serving Minister of Defense (47 years). He presided over the worst periods of political repression and economic centralization in Cuba and is responsible for numerous executions after he and his brother assumed power, and some while in Mexico and the Sierra Maestra before reaching power. Raul has been a loyal follower and cheerleader of Fidel’s anti-American and pro-Soviet policies and military interventions in Africa and elsewhere. In 1962, Raul and Soviet Premier Nikita Khrushchev conspired to surreptitiously introduce nuclear missiles into Cuba. Raul supervised the Americas Department in Cuba, approving support for terrorist, guerrilla and revolutionary groups throughout Latin America, and the Middle East. In 1996, he personally ordered the shooting down of two Brothers to the Rescue unarmed civilian planes in international waters, killing three U.S. citizens and one Cuban-American resident from Florida. At 84 years of age, General Castro wants to muddle through these difficult times introducing limited changes and maintaining tight political control. His aim is to calm down a growing unhappy population and to prevent a social explosion, not to transform Cuba into a capitalist society. By his actions and statements, Raul Castro is signaling that Cuba will remain a failed totalitarian experiment for the foreseeable future. His relinquishing the Presidency to a minor communist Party bureaucrat in February 2018, while remaining as Secretary General of the Party and de facto leader of the military is a clear indication of a succession and not a transition process. The future new President has no military or popular support and will be beholding to the wishes of Raul and his close military allies in the Party’s Politburo. 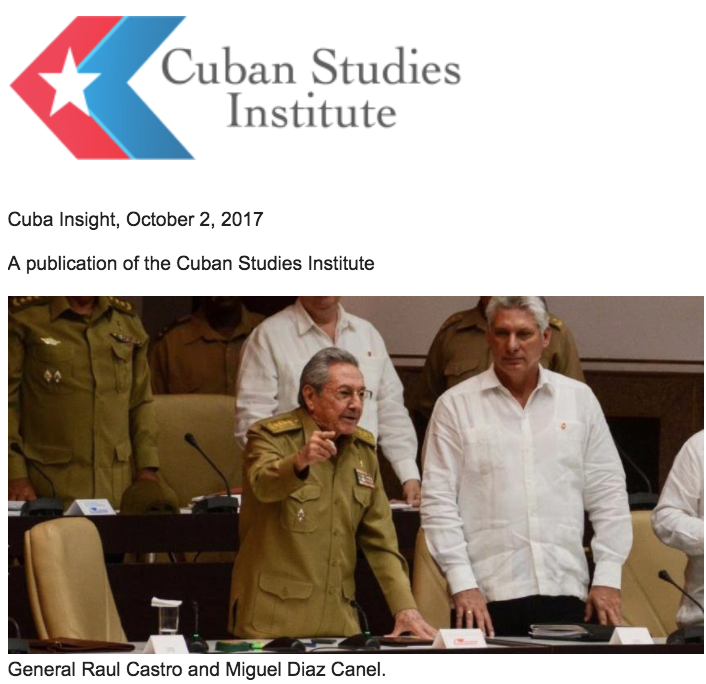 The recent creation of a military “troika” to rule over the three regions of Cuba is a further example of a militarized succession in the island. North Korea's Kim Jong Un and Miguel Diaz Canel in Pyongyang. Raul does not seem ready to provide meaningful and irreversible concessions for a long-term U.S.-Cuba normalization. Like his brother in the past, public statements and speeches are politically motivated and directed at audiences in Cuba, the U.S. and Europe. Avenues for serious negotiations have never been closed as evidenced by the recent diplomatic normalization under President Obama and migrations and anti-hijacking agreements between the United States and Cuba. Raul is unwilling to renounce the support and close collaboration of countries like Venezuela, China, Iran, North Korea and Russia in exchange for an uncertain relationship with the United States. At a time that anti-Americanism is strong in Asia, the Middle East and elsewhere, Raúl’s policies are more likely to remain closer to regimes that are not particularly friendly to the United States and that demand little from Cuban in return for generous aid. Yet there is the strong belief in the United States that economic considerations could influence Cuban policy decisions, and that an economically deteriorating situation could force the Castro regime to move Cuba toward a market economy and eventually toward political reforms. This has not happened and is not likely to happen. Among many in the United States, there is still a belief that the embargo is the cause of Cuba’s economic ills. This notion has been propagated continuously by the Castro regime to force the United States to unilaterally lift U.S. sanctions. In reality, the cause of Cuba’s economic problems is not the embargo but a failed economic system. Like the Soviet and Eastern European Marxist economies, Cuba’s system is antiquated, inefficient and corrupt. It does not encourage productivity or individual initiative. If Cuba were to export and produce more, it could buy any products it needs from other countries. For Cuba, the Unites States is the closest but not the cheapest market. What the Castro regime welcomes is American tourists and credits to help scrape by without making major economic or political changes. We also believe that leaders from other countries are very much like American leaders, except that they speak a different language. We assume that these leaders share our values and perceptions and that, therefore, they will behave as we do. We believe that we can negotiate with them most, if not all, of our mutual problems, that we can find common ground and work out differences. Nothing could be further from the truth. There are leaders, particularly in the developing world, who don’t share Western values. They see the world very differently than we do. Perhaps the result of their educational, religious, or cultural background, perhaps the result of their own experiences, they think and act very differently. The Castro brothers belong to this group. They have a commitment to remain in power. Compromise is seen as a short-term, sometimes forced, tactical moves to achieve long-term strategic objectives. Negotiations with these leaders are usually of little value, and agreements of short duration. America’s long-held belief that, through negotiations and incentives, we can influence Raul’s behavior has been weakened by his unwillingness to provide major concessions to the United States. He prefers to sacrifice the economic well-being of the Cubans, rather than cave in to demands for a different Cuba, politically and economically. Neither economic incentives nor punishment have worked with Cuba in the past. They’re not likely to work in the future. Cuba’s smuggling of weapons on a North Korean freighter in 2014 seems to indicate Raul’s Castro continuous commitment to internationalism and his willingness to violate international laws to support an ally. Like in the 1970’s and 1980’s when the brothers played a major role in Africa and the Middle East with Soviet support, this incident shows that, even without the backing of a major power, Cuba remains a player in foreign affairs. In this hemisphere the Castro regime seems to be taking a back-stage role. Cuba’s involvement in regional groups is limited, with Raul Castro preferring to deal in bilateral relations. Raul prefers to take a behind the scene role, especially in his espousal of anti-Americanism, to not jeopardize his chances of getting further unilateral concessions from the United States. Raul will leave Maduro to carry on the more vocal anti-American struggle. General Raul Castro's son Alejandro Castro Espin, a colonel/coordinator of the military and security forces. If Raul Castro were to die or become incapacitated, it will be the Politburo of Cuba’s Communist Party who will decide on a replacement. While Raul designated Miguel Diaz Canel as his successor, his promotion will depend on circumstances at the time. If the succession occurs under increased social pressure or violence, it is likely that the Politburo will select a hard liner, probably from the military. Given that most of the members of the Politburo are military, this group will make the ultimate decision. Although Diaz Canel also has military rank, it is not likely that the Generals in the Politburo will turn to him at a time of crisis. If the succession is peaceful and Diaz Canel assumes the presidency in February 2018, he has to contend with the power of the older generals, Raul and Raúl’s son Alejandro Castro Espin, a colonel/coordinator of the military and security forces and an emerging force. Without support within the military or in the party, Diaz Canel remains as a puppet figure with limited power. The key question about post-Castro Cuba is not who its new rulers will be or what they would like to accomplish. The key question is whether the institutionalization of the revolution under the control of the military, the party and the security apparatus will survive the transition from Raul Castro’s rule. And equally important, what can any emerging leadership hope to accomplish within the existing socio-political and economic context. There are also other key and more troubling questions: Will the new rulers be able to exercise any major options at all? Will they fear upsetting the multilevel balance of interests upon which new government will certainly depend? • A terrorized, disorganized and fearful population hoping for change from above. There is a strong belief among the Cuban people about the efficacy of the security services and an overwhelming fear of their repressive capabilities. The political elite see the development of a civil society as a major challenge to its absolute authority and a threat to its long-term control. The limited gains made by a civil society independent of the Castro brothers in the past few years, are the result of a deteriorating economy; disillusionment with the revolution and growing unhappiness with the Castro regime; influence of outside forces; and a limited relaxation of the system’s control. Yet civil society remains weak, not very effective and watched carefully and constantly by the security forces. • The military, the most important institution in contemporary Cuba, has significant legitimacy and respect and is a disciplined and loyal force. It controls more than 60 % of the economy. Will they be willing to relinquish this economic control and their prominent role? One of Cuba’s major post-Castro challenge will be how to extricate the military from the economy and put them back in the barracks. The possibility of regime continuity, therefore, seems stronger for Cuba than it was for other communist states. Although their end came suddenly, it took decades of decay to weaken critically the Eastern European regimes and successive leadership changes, as well as Soviet disengagement and acceptance, before the collapse. In Poland where the trade union Solidarity was born in 1980, as the first non-government trade union in communist history, a military-led government remained in power for a decade. In China, the communist regime obtained a new lease on life following Mao’s death, initially through Deng’s reforms and then ultimately through increased repression. It is likely that the post-Raul Castro leadership will draw some lessons from these events and attempt to satisfy the needs of the Cuban people. They will initially purchase massive amounts of food to satisfy one of Cuban’s major complaints. After a while they may deepen economic reforms, allowing private ownership of land in an attempt to increase food productivity; encourage foreign investments in key sectors where Cuba lacks technology or capital, i.e., off-shore oil exploration and consumer goods. They will have to deal with the growing discontent of Cuban blacks, deprived of Cuban-American remittances, and increasingly rebellious and alienated from the system. Changes, however, may not usher in a period of rapid political or economic transformation or in a collapse of the regime. The stability of the Cuban system is based primarily on the strength of the Armed Forces, the security apparatus, and the Party structure. The organization and strength of the bureaucracy that has grown around these institutions seem to assure short term continuity. Barring the imponderable or unpredictable, rapid change is not likely. Perhaps the critical challenge for a post-Raul regime will be to improve the economy and satisfy the needs and expectations of the population, while maintaining continuous political control. Too rapid economic reforms may lead to a loosening of political control, a fact feared by the military, and other allies bent on remaining in power and continue to profit from their privileged positions. Unfortunately for the Cubans, transition may be slow and painful. Havana after Hurricane Irma. The Cuban situation is aggravated by more than half a century of lack of buildings maintenance. Note: An abbreviated version of this article was published in the “Latin American Advisor,” Interamerican Dialogue, August 14, 2017. *Jaime Suchlicki is Director of the Cuban Studies Institute, CSI, a non-profit research group in Coral Gables, FL. He is the author of Cuba: From Columbus to Castro & Beyond, now in its 5th edition; Mexico: From Montezuma to the Rise of the PAN, 2nd edition, and of the recently published Breve Historia de Cuba. This is a publication of the Cuban Studies Institute. The United States will reportedly retaliate against Cuba for its attacks on American diplomats in Havana by expelling the majority of Cuba’s embassy staff here. The report in the Miami Herald was based on “multiple sources familiar with the plan,” three of whom said the announcement will come Tuesday. According to those sources, the State Department will kick out nearly two-thirds of the Communist regime’s personnel in its Washington outpost. The U.S. has pulled most of its own diplomats out of its embassy in Havana last month after mysterious “sonic” attacks sickened at least 25 Americans there. U.S. officials told the Associated Press that the intention wasn’t to retaliate against Cuba, but to ensure that the countries maintain a similar number of diplomats in other’s capital. The U.S. and Cuba only re-established diplomatic relations last year at the initiative of the Obama administration, a move President Trump was critical of as a candidate but has not undone. They had been cut off more than a half-century ago as Fidel Castro established a communist dictatorship that remains in power to this day. WASHINGTON — AP sources: US confirms additional victim of mysterious attacks in Cuba, raising total to 22 Americans in all. But who were the rockets for? The Jie Shun's final secret would take months to resolve and would yield perhaps the biggest surprise of all: The buyers were the Egyptians themselves. A U.N. investigation uncovered a complex arrangement in which Egyptian business executives ordered millions of dollars worth of North Korean rockets for the country's military while also taking pains to keep the transaction hidden, according to U.S. officials and Western diplomats familiar with the findings. The incident, many details of which were never publicly revealed, prompted the latest in a series of intense, if private, U.S. complaints over Egyptian efforts to obtain banned military hardware from Pyongyang, the officials said. It also shed light on a little-understood global arms trade that has become an increasingly vital financial lifeline for North Korean leader Kim Jong Un in the wake of unprecedented economic sanctions. A statement from the Egyptian Embassy in Washington pointed to Egypt's "transparency" and cooperation with U.N. officials in finding and destroying the contraband. "Egypt will continue to abide by all Security Council resolutions and will always be in conformity with these resolutions as they restrain military purchases from North Korea," the statement said. But U.S. officials confirmed that delivery of the rockets was foiled only when U.S. intelligence agencies spotted the vessel and alerted Egyptian authorities through diplomatic channels — essentially forcing them to take action — said current and former U.S. officials and diplomats briefed on the events. The officials, who spoke on the condition of anonymity to discuss U.S. and U.N. findings, said the Jie Shun episode was one of a series of clandestine deals that led the Trump administration to freeze or delay nearly $300 million in military aid to Egypt over the summer.